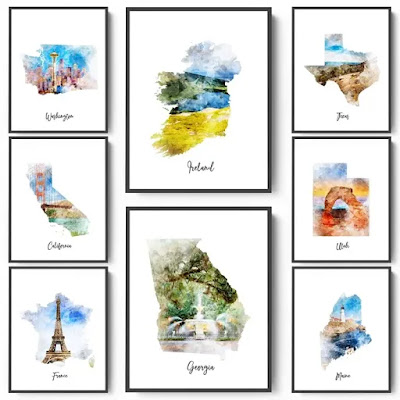 I LOVE these Watercolor Map Prints in 7 Sizes for ONLY $3.99 (Retail $14.99)! These watercolor map prints would make for stunning and unique wall decor for your home or office. Celebrate your honeymoon destination, your favorite city, your wanderlust, your hometown or heritage. These would also make wonderful gifts for your child's geography or foreign language teacher. For this deal, we are offering you 7 different sizes of prints! Choose from 5x7, 8x10, 10x12, 11x14, 12x16, 12x18 or 13x19.After listening to customer feedback, we are also now giving you the option of choosing whether you want your print-oriented portrait/vertical or landscape/horizontal!